So…I had a different article planned for this month. I was going to talk about exciting new releases by Little Silver, Wolf Alice, and Bent Knee, and of course there would be a tribute to Tom Petty, who we sadly lost this month…I’m still wrapping my head around that one. But then I awoke this morning to news that Gord Downie passed away and everything changed. Talk of iconic Canadian musicians almost always involves nods to Rush – one of the most successful bands in the world – or tongue-in-cheek jabs at Loverboy and Glass Tiger. More serious music fans will discuss Neil Young, Joni Mitchell, and Bruce Cockburn, while hipsters point to Arcade Fire and Broken Social Scene and the pop kids, well, they just love their Drake. However, there is absolutely no band that is more Canadian than the Tragically Hip and no performer more iconic than Gord Downie. His songs lived and breathed Canadiana and that spirit is just as ingrained into the cultural landscape as hockey and good manners. Downie formed the Hip in 1983 with childhood pals Bobby Baker, Paul Langlois, Gord Sinclair, and Johnny Fay and they went on to release fourteen studio albums in what is one of the longest unbroken band lineups in history. From their self-titled 1987 debut, the scene was immediately set with “Small Town Bringdown”, which talks of life in a nowhere town. So many of their songs dealt with topics such as these – the human condition and the struggle of the everyman in “nowhereland” – but many were also about events or figures in Canadian history, or they mention specific place names or images from folklore. It was this sort of thing that drew this band to the hearts of pretty much every Canadian. This is what also limited their scope to Canada. While the Hip enjoyed massive success in their homeland, the US market proved tough to crack. All of their albums were released here, and they regularly toured clubs to a cult-sized audience, but their mainstream exposure was limited to one 1995 appearance on SNL and then all the news headlines of today, and very little in between. While it would have been nice to see them get some level of respect down here, it’s almost for the better that they didn’t. This is a band that is very much a part of its country’s heritage and culture. They were, are, and forever will be Canada’s Band. While the Hip was priority one, Downie kept plenty busy outside the band, releasing five solo albums (a sixth is due at the end of this month) with a variety of musicians such as Kevin Drew, Julie Doiron, The Sadies, and Chris Walla. Given how distinct his voice and writing is, these solo albums present the Gord as we all know and love him, but in a less polished setting. Gord also worked tirelessly on environmental issues as well as working towards reconciliation between Indigenous peoples and the rest of Canada. His 2016 album, Secret Path, tells the story of Charlie Wenjack, a boy who froze to death while walking 400 miles home, escaping an Indian residential school. This album was accompanied by a film and a graphic novel and all proceeds support reconciliation efforts. For all of his work, both onstage and off, Gord (along with the rest of the band) were awarded the Order Of Canada, earlier this year. In late 2015, Downie was diagnosed with gliobastoma, a terminal form of brain cancer. This came just as the Hip were finishing up their 14th album, Man Machine Poem and plotting a summer tour. For Gord, the question of his fate was not “if” but “when” and he was faced with a choice – either give up or go down swinging. The choice was obvious so, in May 2016, he went public with his illness while at the same time announcing the album and the tour, which took the band across Canada for one last go. The final show of the tour was broadcast live throughout the country – I was in Canada at the time and it was humbling to watch an entire country drop everything and tune in for one extremely emotional evening. 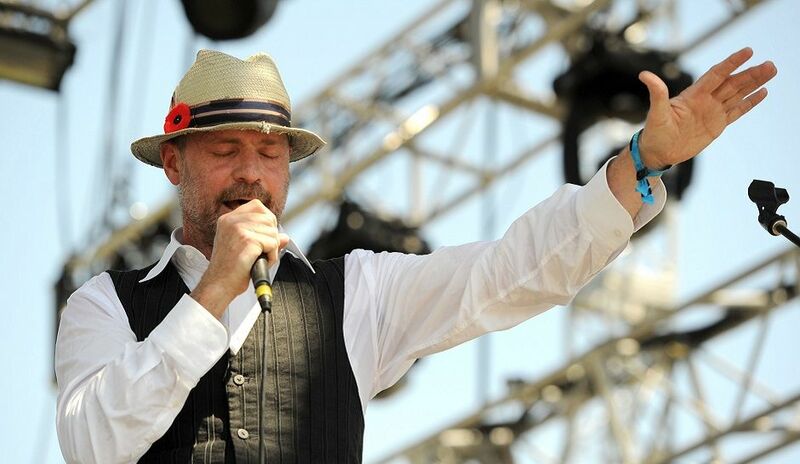 Since then, Gord released Secret Path and performed a few shows in support of that, as well as recording the upcoming double album, Introduce Yerself. He also mentioned, in his last big interview, that the Hip was working on a new album as well. One of the band’s signature songs is called “Courage” and that man had buckets of it. My own experience with the Hip involved being dragged by my best friend, against my will I might add, to their show at the 9:30 Club on October 3rd 1998, while they were touring behind Phantom Power. I didn’t really know much about this band other than they were Canadian and my friend loved them (probably because they were Canadian). I was pretty grumpy about going but he insisted. I don’t even think they were done with the first song before I realized just what was happening – it was love at first sight. It wasn’t long before I had all of their albums, and I’ve continued to follow them closely, ever since. One of the most reliable bands of all time, their albums never faltered. Even when they hired Bob Rock to produce World Container and We Are The Same, in an attempt to simplify their sound, The Hip was still The Hip. Whether the world ever gets to hear that 15th Hip album remains to be seen, but the legacy that Gord and the band left behind is one of the richest of any artist’s output. Gordon Downie entertained and inspired a nation and his impact went far beyond his country’s borders. He was truly one of a kind, the likes of which we will never see again. Thank you, Gord, for everything you’ve given us. May you rest easy and live forever.